Featuring the largest floor plans in the area, Forest Oaks Apartment Homes has plenty of space for you and your belongings. With so much room, you can customize your one, two, or three bedroom Rock Hill, South Carolina, apartment to fit your life and your style. Our layouts range from 882 to 1,393 sq. ft. and offer a variety of stylish features to enhance your home. Plus, each Morgan Properties apartment undergoes a 101-point inspection so you can rest assured that your home meets our high standards. Embrace the high life in your sophisticated new space at Forest Oaks Apartment Homes. Cook gourmet meals for friends and family in your fully equipped kitchen, complete with stainless-steel sinks, a beautiful backsplash, and a timesaving dishwasher. At the end of the day, unwind with a glass of wine on your private balcony or patio. Discover upgraded living at Forest Oaks Apartment Homes. 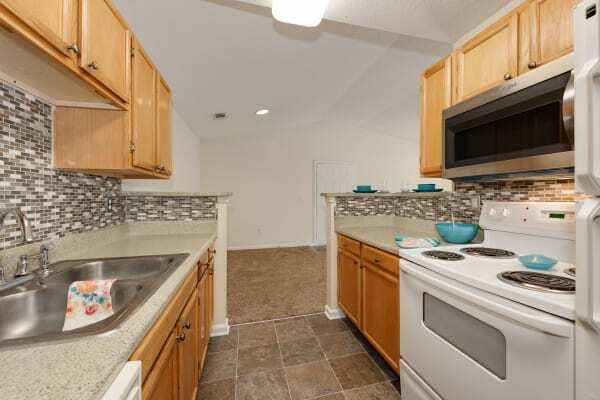 Call our leasing team today to set up your VIP tour of our Rock Hill, SC, apartments for rent.